Back in 2006 Dutch illustrator and filmmaker Michael Dudok de Wit, who previously had made short films Father and Daughter and The Monk and the Fish, received an unsolicited letter from the legendary Japanese animation house Studio Ghibli offering to produce his debut feature. A decade later the first non-Japanese Studio Ghibli production premiered at Cannes where it received widespread acclaim, going on to receive a nomination in the Best Animated Feature category at the 2017 Academy Awards. For many the stamp of Studio Ghibli has come to be known one of the most consistent guarantees of quality in modern cinema, responsible for numerous modern classics including The Wind Rises, Princess Mononokeand Ponyo. Largely this has been down to the creative influence of studio co-founders Hayao Miyazaki and Isao Takahata, who between them they have directed the majority of Studio Ghibli’s output. For a European director to be asked to make a Ghibli film is an unprecedented step for the production house and yet Studio Ghibli’s ethos has always looked to mesh Western and Japanese sensibilities; drawing on Manga comics as well as early Disney cartoons, blending European folk tales with Japanese myths and marrying the emotional complexity of Neo-Realism with the epic sweep of Kurosawa. Michael Dudok de Wit brings his own distinct aesthetic but there is no doubting that this film is quintessentially a Ghibli work. The Red Turtle opens with an unnamed man adrift in a raging sea, he then washes up on a beach where he discovers he is alone and marooned on a small tropical island. The man is continually frustrated in his efforts to leave the island by a large sea creature that repeatedly destroys his makeshift rafts, this creature we later discover to be a giant red turtle. What follows is a moving fable about man’s relationship to the natural world and accepting the cyclical nature of life. The film is without dialogue and the narrative itself is fairly slim, in the manner of silent cinema the story unfolds almost entirely visually with the help of rich sound design and sparse but very effective music cues. 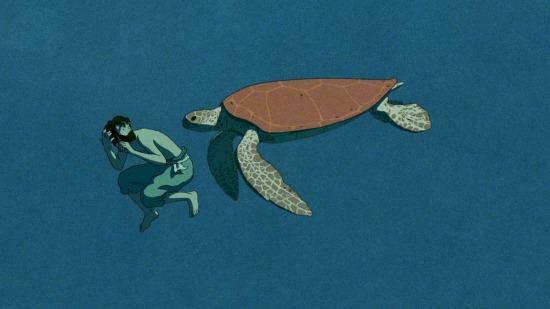 As in the Ghibli tradition The Red Turtle uses magical elements to explore philosophical ideas in a way that is unobtrusive and perfectly integrated into the fabric of the story. There are dream sequences where the man sees a string quartet playing on the beach, a wave mid-break is frozen in time, and there are breathtakingly realised scenes where swimming through the ocean becomes soaring through the air almost seamlessly. The director and his team have not packed each frame but instead focused on creating a sense of space through minimal compositions, using the texture of inks and watercolours to represent the natural world as a place of contrasts but fundamentally as something homogeneous. There is more than a hint of the simple precision of Hergé in the way Michael Dudok de Wit draws humans in particular that provides a lovely counterpoint to painterly skies and seas that appear to stretch to infinity. Over the course of the story we witness events repeating themselves with subtle differences and in doing so they come to represent both circularity and progression. In a sense this is a fitting description of Studio Ghibli’s history. Miyazaki has retired from film making more than once but has been repeatedly drawn back to the process and is now reportedly working on a new project. The Red Turtle explores ideas about mortality, nature, family and the passage of time, the same subject matter that has concerned Miyazaki over his career, but there is so much to admire about the way The Red Turtle interweaves visual splendour, emotion and philosophy. On the evidence of this Studio Ghibli is still as relevant today as it ever was and perhaps if Michael Dudok de Wit chooses to make another feature he may take the studio to even greater heights.